Joni Peterson is catapulted through time into a world both familiar and strange. Finding herself in Victorian England, she discovers love in the most unexpected place—at the feet of the man whose carriage knocked her down. Lord Sebastian Tyler needs to remarry, but preferably not to a woman of his mother’s choosing. The woman his carriage runs over both irritates and fascinates him, but could she be the answer to his prayers? 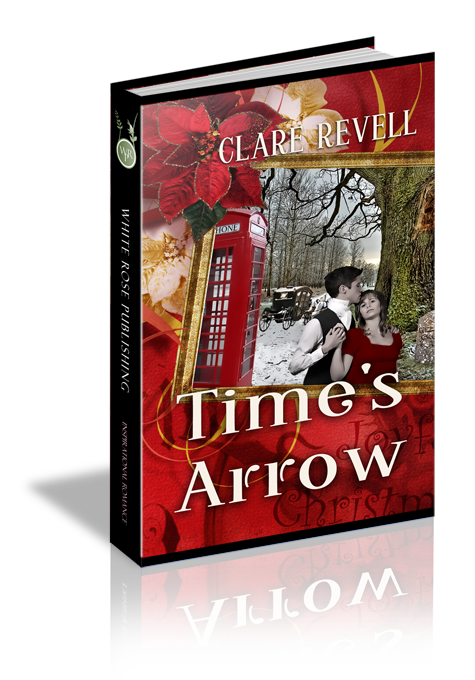 Will the arrow of love find them before time runs out and history rights itself? Jonni tossed the book to one side as the phone beeped. It was bad enough listening to the wind rattling the windows of the huge manor house, without reading about it, too. In six weeks when Dawn, and her new husband Gabriel, returned from their honeymoon, Jonni would tell them to buy some new books for their library. With a whole room of floor-to-ceiling shelves, they should have something other than just classics and gothic horror. Gabriel, being an author, not to mention an earl, should know better. Jonni shook her head at the thought of her friend being the mistress of this huge house. Dawn was the last person Jonni’d imagine married to an earl—after herself. That only happened in fairy tales. She picked up the phone as it beeped again. House sitting for them was all well and good, but once Christmas and New Year’s were out of the way, she had to find a new job—working for her ex-boyfriend and ex-boss wasn’t an option. She started to tap out a reply, then stopped and closed her eyes. Lord, help me here. Give me the words to get the message across to him this time. Jonni cancelled the text and rang Bryan’s office. If he was in a meeting, his new secretary could take a message. Almost immediately, Bryan’s voice echoed in her ear. The low, husky tone that oozed sensuality now twisted her stomach, as much as it had once made it do cartwheels. Along with his charm and good looks, and—no. She stopped herself short. He was a liar and she was best out of it. She could see the smirk on his face as he spoke. He thought he’d won because she called. As if a huge weight had been lifted from her, Jonni hung up and deleted his name and number. Something she should have done days ago. She took a deep breath, the warm yeasty smell of baking…the bread. Jumping up, she hurried to the kitchen, not wanting it to burn. She grabbed the oven gloves and took the baking tray out. She tapped the loaf, smiling at the hollow sound, before placing it onto a cooling rack. Now all she had to do was run into the village for some cheese and butter, and tea was done. Maybe the walk would encourage her non-existent appetite to return. Heading upstairs past the huge Christmas tree that dominated the hall, Jonni ran her fingers along the exquisitely carved oak banisters. She pushed open her bedroom door and crossed the room, clicking in exasperation as she tripped over the loose floorboard. One of these days someone was going to fall over properly and hurt themselves. Knowing her luck, it’d be her. Something else to leave in the note for Gabriel. She pulled on her coat and headed back downstairs. She’d hoped for snow for Christmas, but frost was fine. No matter what the weather, it always showcased God’s creation to the full. She wrapped a scarf around her neck and pulled a hat over her ears. Humming Silent Night, Jonni stepped into the bitter cold and shut the front door, catching a last glimpse of the high-ceilinged hallway, magnificent wooden staircase, and checkered floor. She ran down the stone steps and turned to look at Southby—the ancestral home of the Earl of Elton. It was breathtaking. The sloping roof, long wings around the central courtyard and huge shuttered windows—even in five days, she’d not explored a fraction of it, yet. Jonni walked along the half mile driveway to the main road. She’d give her right arm to see this house in its heyday. It must have been amazing with its servants, and lord and lady in their fantastic clothes, holding parties and living in a way she couldn’t even imagine. Especially at Christmas, singing carols around the piano and the tree alight with candles in the background. She paused as she reached the oaks standing tall and proud by the entrance to the estate. The bark was rough and gnarly under her hands as she touched it. If this tree could talk, what stories it could tell. Jonni ran her fingers over the carved symbol on the tree trunk. The wood felt old under her fingers, yet love emanated from the carving. A heart encircling two sets of initials, ST and JP. She wondered who they were and whether JP, whose initials matched her own, had done the engraving, or stood and watched while ST did them. She headed left onto the main road, praying as she walked. Show me what You want me to do, Lord. Right now, things are confused and I hurt. Why did Bryan treat me like that? Is it because I didn’t give him what he wanted? Or is it my fault for dating my boss? Lord, above everything else, I am Yours, and I know You have a reason for this. I trust in what it says in Romans eight, twenty-eight. Right now, I can’t see the good in this, but I know You can. Give me the patience to wait until You make things clear to me. Reaching the pedestrian crossing, Jonni pressed the button to change the lights. She glanced down at the ancient milestone, standing next to the lamp post. It looked as though it had been there at least two hundred years. What had Headley Cross looked like, then? The lights changed and the traffic stopped. As the neon-green walking man came on to indicate she could safely cross the road, Jonni rested her hand on the top of the milestone. Bet you could tell a tale or two if you could talk. Jonni stepped off the pavement and onto the road. From out of nowhere, came a shout and a rush of hooves. Something hit her hard and she cried out. She raised a hand to her head, stumbling forward for an instant, before an invisible force slammed her to the ground. She tried to shield herself from the four hooves dancing around her. Voices echoed. A pair of boots entered her field of vision before her eyes closed and blackness surrounded her. “Aye, Sir.” Hattie jumped down and shut the door behind her. “No, Sir. There’s been an accident.” His valet, John moved out of the way. Sebastian caught sight of the bloodied and battered figure on the ground. Hiding his shock and dismay, he knelt beside the girl. She had no shoes and wore precious little in the way of clothes under her...was that a frock coat over men’s clothing? Who is she, Lord? How did she end up under my carriage? The road is clearly visible in both directions. Is this a deliberate attempt to take her life? Sebastian knew he had to get the woman seen by a doctor. He wasn’t going to be responsible for her death and the December air made it too cold to tarry on the road. John pulled down the blanket from the driver’s seat and wrapped the young woman in it, then carried her around the horses to the carriage door. “We can’t just take her back to Southby with us. You don’t know what diseases she might have. Think of the expense.” His mother’s tone became even more indignant than usual. He hadn’t thought that possible. Ignoring his mother’s sigh, Sebastian climbed back into the carriage and they resumed their journey. It wasn’t long before his mother recommenced her favorite topic. He tuned her out, knowing what she was going to say. She spent every spare minute either lecturing him, or setting him up with yet another girl from a titled family. Lord, if only she knew how weary I am of the whole charade, never mind the effort of having to be polite to yet another girl who is only interested in playing the piano, going shopping, and flirting outrageously with every man she sees, in the hope of gaining a husband. Preferably, a rich husband who will give her a high position in society, and thereby the freedom to do whatsoever she pleases with her time. Sebastian pushed a hand though his hair. He looked out the window, watching the fields go by. I’ve been through one arranged marriage, Lord. You know how that worked out. Even though she was neither sweet-tempered nor pretty, she was my wife and I honored her as I ought to, Lord, but I can’t do it again. His thoughts turned to his daughter. Although he had no son to inherit the earldom, Alexandrina had, indeed, made all the heartache in his marriage worthwhile. Perhaps Mother is right. I need to marry and produce a male heir and as soon as I find someone suitable, I will. However, another flighty, hypocritical cold wife is not on the agenda any time soon. This time, Lord, we chose her together, and please, a woman of strong constitution. I could not endure another miscarriage. Of the five pregnancies in his eight-year marriage, four had not survived until birth. His gaze fell on the young woman lying motionless across the seat. The blanket had fallen open, exposing far more flesh through her torn clothing than was decent. He hadn’t even seen that much of his wife in all their years of marriage. In fact, he couldn’t remember seeing Mary unclothed, at all. He leaned over and pulled the blanket closed. Who are you and what are you doing under my carriage? Lord, restore this situation fast. With quarter day and the Christmas feast coming up, I don’t have the time to deal with...Sebastian averted his gaze…with a woman as distracting as she.